Hygienic - may be steam cleaned and washed with detergents. Save space when not in use. Ideal for closed loop systems. Free access reduces pallet damage. To transport a large amount of goods, wooden pallets are traditionally used; however, there are other options out there that may be more suitable for your requirements. 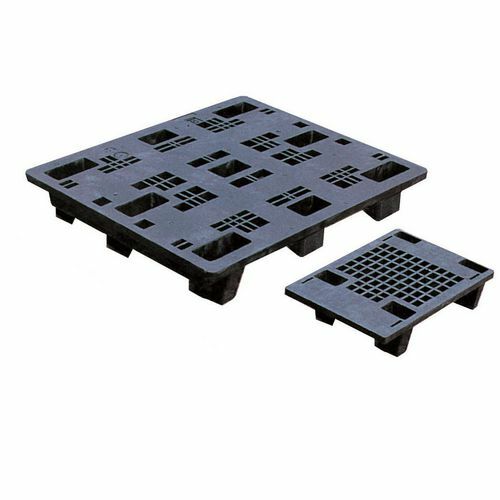 Our recycled plastic pallets are a great alternative to traditional wooden pallets. They are hygienic as they can be steam cleaned and washed with detergents, which makes them more suitable for specialist distributors than wooden pallets. These pallets are ideal for closed loop systems and they save space when not in use. Free access helps to reduce damage to the pallets making them longer lasting products. There are four sizes to choose from; 400 x 600, 600 x 800, 800 x 1200 or 1000 x 1200mm. The different sizes have dynamic load capacities; 200, 350, 500, 800 or 1000kg. These options will allow you to find the best fit for your requirements. Our recycled plastic pallets are a great alternative to traditional wooden pallets. They come with a 12 month guarantee and Next Day Delivery.